A first version of a digital transcript function has been added to the Accredible dashboard (available to all students who have completed one or more courses). There are a few items to tidy up, mostly some text overflow issues and a missing logo (these fixes are already in the works), but the main bits are all there: course code and title, grade, date completed, and a course description that displays when you click on the entry for a course. A print button takes you directly to a dialog where you can print out your transcript or save it to a PDF file (whence it can be posted online, emailed, etc.). One nice feature, at present, is the ability to print a version with our without course descriptions — each course can be expanded to show its description, and choosing to print after expanding preserves the displayed information. 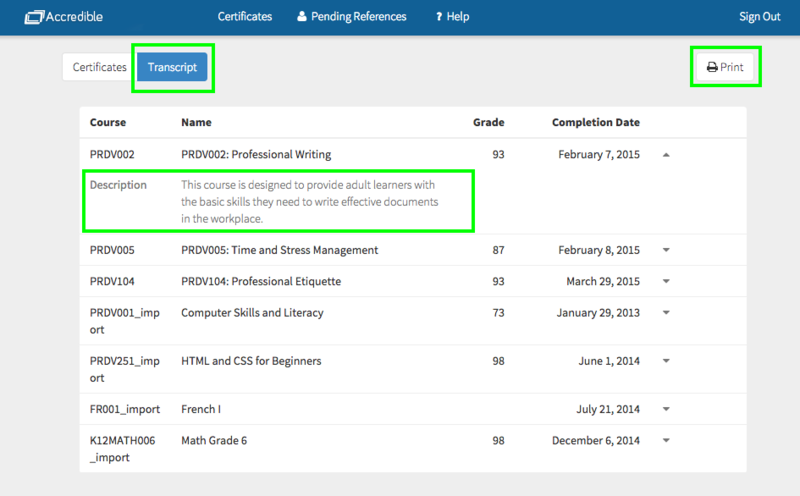 The ability to show courses from multiple providers that use Accredible or to show course from one provider only. Links to the related course certificate, so that a transcript could act as a dashboard of sorts to your certificates and related evidence items. So, with this transcript having just appeared, what are your thoughts? What would make this transcript more useful to you? Verified Certificates Survey ResultsThank You Lou Pugliese! I do appreciate the way the Saylor staff is well motivated in order to suit people on planet earth higher and better online education that fit them. Obviously, that tells me that they are working as well very hard regarding the “ACCREDITATION PROCESS” of the platform.